Cloud computing has changed many of the ways in which we work. Initially the cloud was a good option for storing files at a reasonable cost, and it still is if you aren’t too concerned about security. But hosting your data in the cloud was only one change the cloud brought us, and if you look at what is available today, that was or is possibly the simplest service possible. The capabilities of the cloud expanded over time to include a number of other products, or to be more accurate, services. Hosting capabilities today can put almost any application in the cloud, allowing users to do whatever their business is with little more than an Internet connection; we can now find applications, platforms, infrastructure, security, access control, video surveillance and many other functions available at the click of a mouse (almost) or available ‘as-a-service’. The idea is that instead of buying or renting all the kit you need to run whatever the service is, you simply pay a monthly fee and your service provider does all the technical work and you benefit from the results of the service. For example, if you opt for a video surveillance service, you would pay a fee to have a certain number of cameras installed and maintained, with the video being streamed to an offsite (cloud) storage location – of course, integrated on- and off-site solutions are also common. You would access the video from an application or browser via the Internet or your mobile device. It’s a good idea if your bandwidth can handle it, or if you can handle the costs of bandwidth. When it comes to the benefits of services like this, we’re told that cost is one of the primary advantages. You pay for a service, not the hardware and software and installation and maintenance. You also don’t worry about hardware as the service provider has deliverables they are responsible for and have to ensure you get what was contracted for. Another is that you always have access to the latest software being used as you load it from the provider’s server and the latest version is always there. Of course, not everyone is happy simply moving everything to a third party and hybrid installations have become more of the norm – some things are remote and used as a service, others are still onsite, although seamlessly integrated into the service offering. 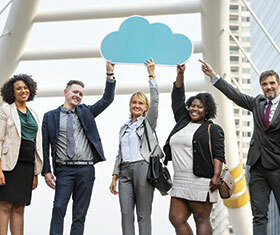 On a side note, moving away from the cost question, it’s also worth noting that Tim Palmquist, VP for Milestone Americas, noted at the MIPS 2019 conference in the US that while Milestone still sells licences in the traditional client-server model, it is looking at ‘taking the journey of hybrid to the cloud’, looking at ways to make best use of cloud technologies and traditional on-site client-server products. (His presentation can be found at www.milestonesys.com/live/tim-palmquist/). The impact of cloud and remote services is therefore something everyone is paying attention to for the future. The security market is no stranger to the as-a-service model. Your armed response fee pays for a service, for example, and we are seeing more security functions, both physical and cybersecurity, being offered as a service. To get an idea of how the service model is growing in the industry and if it’s worth considering making the move, Hi-Tech Security Solutions asked iPulse Systems and Verifier for some insights into their offerings and how the as-a-service model has and is impacting their businesses. iPulse is a South African company that builds biometric readers and has been in the business for years. It sells to small and large companies, with hardware and software that covers single or multi-site installations. While it started out in the traditional access control business, the company’s software has changed the way it works and it recently launched an Access-Control-as-a-Service (ACaaS) solution, which includes workforce management. Verifier was founded in 2009 and is a multi-platform, remote off-site CCTV monitoring service primarily focusing on monitoring triggered events, such as video analytics rule breaches, licence plate recognition alerts, alarm activations and so on. While it seems as if everything we do is angling to adopt the as-a-service model in the chase for recurring revenue, is it realistic to move to everything-as-a-service, especially in the security market? Chalmers uses Seacom as an example; the company has biometric devices in multiple offices and locations throughout Africa, all neatly managed from its head office in South Africa. He adds that the primary benefit to the user is the single point of responsibility in terms of the SLA (service-level agreement). In this model, the integrator is able to apply more resources to the site, as the gross margin is higher in relation to the overall basket of services being contracted for. As a note of caution, he also says service models place ‘all eggs in one basket’ and the transparency of service may be affected. The key to as-a-service business models is, as noted, the cloud, or storing information on someone else’s server. This is always a sensitive issue with many people dismissing concerns because of the security involved in data transmission and storage, and others highlighting vulnerabilities they perceive. At the least, this is a question any users of services must ask as they will be liable for losing data if the worst happens. It should be added that ‘the worst’ is often seen as a data breach when hackers use some type of tool to steal the data. In reality, it could also be system failure, human error or contractual discrepancies. One early adopter of cloud systems found out about carefully studying your contract when they wanted to move to a new, cheaper service provider but could not get their data from their initial provider. While these issues should mostly be dealt with by the service provider – backups, system reliability and failover functionality, as well as security in the form of access control, encryption etc. – the catch is, you as the user can’t simply assume your service provider is doing it. You need to know that these things are being done – especially security. He continues that if separate service providers are used for different layers, the user only needs to replace an underperforming layer without having to change all layers at massive time and expense. Separation also requires constant evaluation, thus further keeping service providers true to their SLAs. Chalmers takes a practical position regarding the services iPulse provides, saying that for many companies there is a knee-jerk reaction to storing employee information and data in the cloud. “I think that what many do not realise is that the amount of data actually stored by a security system is a fraction that of payroll systems, most of which have long since migrated to cloud. One of the biggest reactions in this area is to visitor management systems. Chalmers finds this amusing as he would far rather have his data captured in an electronic, controlled environment, which was designed to be PoPI compliant from the start, than writing down a phone number, ID number and registration number into a little dirty book on the reception counter or at the gate. Even for those users itching to save money and benefit from the improved service levels from the as-a-service model, South Africa has one major vulnerability that is basically a Grim Reaper to business and electronic communications – Eskom. As noted in the article in this issue on power management, the country will have another five years at the mercy of this electricity clown car (we hope it’s only five years) and service providers, intermediaries and users need to cater for regular bouts of no electricity. From an iPulse point of view, Chalmers says all iPulse solutions are designed with these principles in mind. “Every device we add to our system is capable of functioning autonomously with no network, and most are configured with battery backup to last up to 24 hours in the event of an outage. It’s clear that the as-a-service model has value for users as well as the service providers, but does it really make that much difference to the amount you have to spend on a solution? After all, at the end of the day, someone has to pay for the technology, the technicians that will set it up and maintain it, and the day-to-day running costs. Does a service model reduce your spend over the term of the contract as opposed to what you would spend over the same period if you did it all yourself? “This is an easy question to answer,” states Chalmers. “Typically, most clients do not consider what the cost of maintaining, repairing and servicing a solution is when they buy it. Statistically speaking, the upfront purchase price is usually less than one-third the total cost of system over its lifetime. Installation, maintenance, accessories, servicing, call-out fees, support fees and annual licence fees usually make up around two-thirds of the costs over a three to five year period. With those types of figures, even if we add in a 20% error rate, the answer to the question raised in the heading to this article must be yes. At the same time, users must understand that as-a-service is not abdication of responsibilities and each client must ensure their service providers provide the security and reliability they require, and that the contract they sign doesn’t dump all the risk of exposure or other problems onto the client.